Logan Criley's For Your Pleasure opens at New Release on March 31st, 6-9 PM. Criley grew up in Los Angeles steeped in examples of Eco’s hyperreality : the artifice of Disneyland, Tudor houses in the suburbs, and the city’s countless pyramids and pagodas arranged without regard for history or context — an architectural incarnation of André Malraux’s “Museum Without Walls.” Little in this sun-bleached sprawl of ersatz aesthetics is as it seems; neoclassical facades conceal cheap condos and strip malls. Criley's paintings blur classical references with landscapes of swimming pools, bleached hair and digital distortions. He parses the relationship between representational image and material object by making paintings of sculptures and building sculptures out of painted canvases. As our surroundings become increasingly copied, printed and cast, it becomes the task of the artist to locate the mold marks. 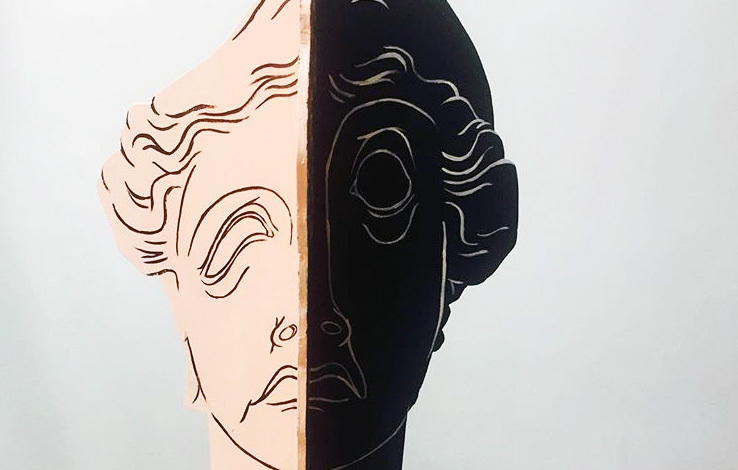 In this case, wood cut-outs form facsimiles of busts on plinths; an homage to the past and an apology to the future. Both Criley's paintings and sculptures displace elements of the landscape: water reflects within a man's silhouette while a swimming pool's hand rail leads a sculpture into the dry earth. By conflating water and earth, two-dimensional and three-dimensional space, art history and a digital future, Criley paints paradox; cryptic allegories for a radically subjective world. Criley leaves the viewer to indulge in these forms for the sake of pleasure, leaving their original arrangement and meaning to history.